This ceremony of the blessing of the home and inscription of the initials of the three Magi above each door can be performed either by a priest or the father of the family. This is from the book The Twelve Days of Christmas by Elsa Chaney. The feast of manifestation, or Epiphany, is traditionally celebrated the 12th day after Christmas, January 6th. In the dioceses of the United States this feast has been moved to the Sunday between January 2 and January 8. See also a home blessing ceremony for Epiphany 2019. Leader (Priest, if present, or father of the family) : Peace be to this house. All: From the east came the Magi to Bethlehem to adore the Lord; and opening their treasures they offered precious gifts: gold for the great King, incense for the true God, and myrrh in symbol of His burial. Leader: Our Father. . .
Leader: O Lord, hear my prayer. Leader: Let us pray. O God, who by the guidance of a star didst on this day manifest Thine only-begotten Son to the Gentiles, mercifully grant that we who know Thee by faith may also attain the vision of Thy glorious majesty. Through Christ our Lord. Leader: Be enlightened, be enlightened, O Jerusalem, for thy light is come, and the glory of the Lord is risen upon thee—Jesus Christ born of the Virgin Mary. All: And the Gentiles shall walk in thy light and kings in the splendor of thy rising, and the glory of the Lord has risen upon thee. Bless, + O Lord God almighty, this home, that in it there may be health, purity, the strength of victory, humility, goodness and mercy, the fulfillment of Thy law, the thanksgiving to God the Father and to the Son and to the Holy Spirit. And may this blessing remain upon this home and upon all who dwell herein. Through Christ our Lord. The custom in Germany is that of the childrens' festival between January 1-6 (Three Kings Day). After a service at the churches the children go from house to house to gather offerings for poor children in poor countries. They are dressed as the three kings and carry sticks with stars on the top. At the homes they sing songs and recite messages of Christmas. At each house they paint the letters "20+C+M+B+19" which are for the Latin Christus Mansionem Benedicat (Christ bless this house). 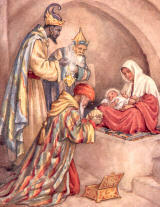 At the same time the letters are the first letters of the names of the wise men: Caspar, Melchior and Balthasar. — Christmas Stories from German Culture.